Marina is a 36-year old local mom of two children who, like most busy working parents, was struggling with her weight while trying to manage all the responsibilities of being a supermom and business owner. After researching many options, Marina settled on trying red light therapy, one of the newest and most technologically advanced fat reduction therapies available on the market. We spoke to Marina about her experience with UltraSlim at Candlewood Aesthetics. Marina, what made you seek out red light therapy? Honestly, I was looking for a way to lose weight and enhance my body without too much work! I own a cleaning business and I have two kids, so my schedule is very hectic. I find it tough to maintain a routine, so I decided to start looking into cosmetic and medical procedures that could help me shed pounds quickly. I came to Candlewood Aesthetics to try UltraSlim, which is a red light therapy treatment. I liked that it was non-invasive and there was no downtime so I could continue on with my regular activities like normal. I had six sessions on my abdomen, thighs, and buttocks and now I’m doing my face and neck. What results have you experienced so far? My results have been amazing and I lost almost six inches in my midsection after six treatments. I’ve also been able to tighten and tone the skin around my chin, jawline, and neck area. 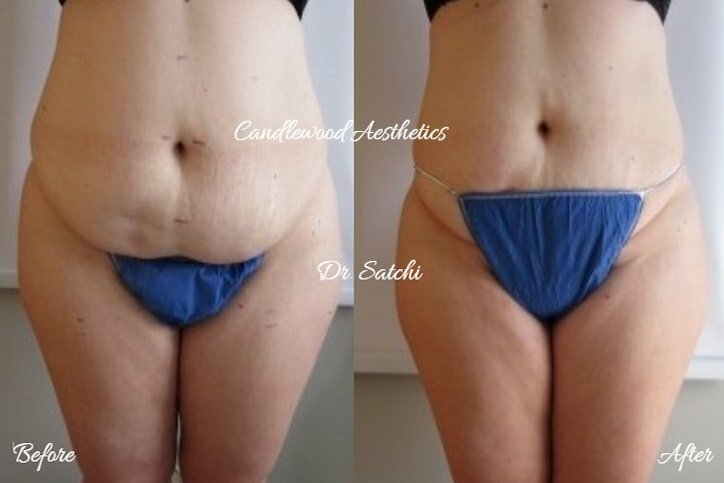 Have the treatments you received from Dr. Satchi changed how you look and feel? Absolutely! I feel so much better about myself and I feel sexier than ever! It’s not just about the way you look, the treatment is a huge confidence booster as well. I am so excited about my results! What would you say to people who are looking for a similar solution? I have highly recommended it to my friends and I love Dr. Satchi and everyone in the office! The staff is so nice! The information above details the experience of a real-life Candlewood Aesthetics patient and is not a paid endorsement. As with any cosmetic or medical aesthetics procedure, results may vary and will be discussed during a client’s complimentary consultation. UltraSlim® is the newest, most effective body sculpting technology which utilizes patented photobiomodulation to drain fat cells and sculpt problem areas instantly. The results are immediate with no side effects or downtime and patients can return to work and their day to day activities directly after treatment. To learn more about this treatment and schedule your complimentary consultation, click here.